My blog is all confused. Or else, more likely, I am. I thought I might e-mail posts while on a recent trip but never did. When I returned home, almost all my previous posts were missing. However, a quasi-duplicate blog seemed to spring up that contained all the old posts—but it looked very strange. So I have copied those posts here. I couldn’t figure out how to put them below my most recent post, so they appear above. From now on the new posts will appear at the top of the blog. If I were more savvy, none of this would have happened. I apologize for your annoyance. Well over 25 years ago I stopped teaching college English and began leading writing seminars for corporations. For at least a decade now, I have been e-mailing a weekly business writing tip to hundreds of people I know in the corporate world. They, in turn, disseminate these tips within their companies, and people also send them to friends and relatives. I honestly have no idea how many people end up reading (or not reading) these tips every week. Some have suggested I start a blog, so here I am, feeling my way, and probably on the cusp of making many mistakes. Please bear with me. 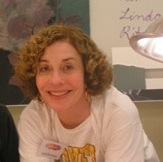 This photo of me was taken at a painting workshop; I am much more left-brained than right-brained. If you would like me to write about particular topics or writing problems, just let me know. I’ll be happy to address them. Last week I wrote about the difference between long and lengthy and how the latter has a negative connotation, implying something is going on longer than it needs to. A long speech may be hard to listen to, but a lengthy one may verge on torture. Most people use lengthy because they think it sounds more professional. It isn’t. The same can be said about simplistic. It is not a fancy-schmancy way to saysimple. It means something that is overly simple, and therefore inadequate. Roger’s simplistic explanation left the audience with more questions than answers. Don’t write to impress. Write to be clear and understood. Isn’t that what you want from others’ communications? This is Sasha, one of our two Russian Blue girls. 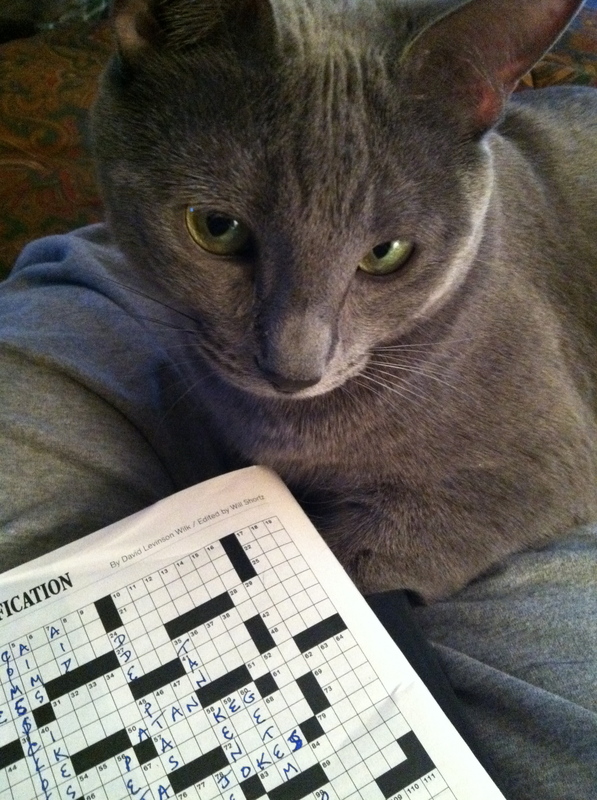 You can see she does the SundayNYT crossword in ink, too, but she hasn’t gotten very far. Of course, her native language is written in Cyrillic, so our alphabet is difficult for her. Something I came across today that annoys me no end: when people want to indicate someone has made a complete change in a position, they often will say the person did a 360˚. Even I, the mathematical moron, know that 360˚s will bring you back to where you started; it’s a full circle. You need to cut that circle in half and do a 180˚. Book I just finished and loved: Wolf Hall, by Hilary Mantel. It covers just a few years, focusing on Thomas Cromwell and his relationship with Henry VIII, who is trying hard to get rid of Catherine of Aragon, marry Anne Boleyn and make England Protestant. So well written. I will soon begin the sequel, Bring Up the Bodies. Recently finished: Arguably, by Christopher Hitchens. A collection of this contrarian’s essays, covering every imaginable topic from light to heavy. The breadth and depth of his knowledge were extraordinary; I cannot think of another writer as brilliant, not in our times at least. You might not agree with every position he takes, but you can’t deny his genius. A real loss when he died last December at only 62. He has another book that just came out, Mortality, chronicling his dealing with esophageal cancer and impending death. Not cheerful, but as ever, brilliantly written. Currently reading on my iPad: Again—Ulysses, by James Joyce. I read this when I wake up in the middle of the night. I read it in college and dipped into it again quite a few years ago. It’s slow going because Joyce’s language is so dense and is usually stream of consciousness, but the book is so entertaining that I keep going. I figure I’ll finish it in about 2018. A loyal reader suggested I go over when you use each of these adjectives. We all were taught early on to use “a” before a word starting with a consonant and “an” before a word beginning with a vowel. But following that rule can sometimes get you in trouble. “Hour” starts with a consonant—but we say/write “an hour” because the “h” is silent. We also say/write “a yellow dog.” “Y” is considered to be a type of vowel, but here it definitely has the sound of a consonant. It was considered correct until fairly recently to use “an” before “history,” “historian,” “historical” [film/book/play, etc. ], but the Association of Cranky English Teachers (of which I am a charter member) decided it was also fine to use “a” before such words. So with “a” and “an,” use your ears, not your eyes.